Talk about bait for a vintage fragrance lover. Add that Herman suggests the collection suits someone comfortable with “unconventional beauty” and “dark glamour,” and I was hooked. Now to see if the collection is more hat than Texan (or maybe more pencil than brow?). Here are my impressions of the collection’s three fragrances, Ma Bête, Belle de Jour, and Night Flower. Notes include Tunisian neroli, spices and Lie’s own “animalic cocktail.” The Eris Parfums press release says Ma Bête suggests “perfumed fur.” Ma Bête comes off as a simple, yet sophisticated, fragrance. At first whiff (I’m sampling from a glass tube, not an atomizer), the rich, juicy neroli raises its head, then quickly dives into a black-and-white movie of dry leather and the vague decay you smell in Guerlain Mouchoir de Monsieur. Do I sound like I’m putting Ma Bête down? I’m not. The fragrance is almost a unisex, less-floral take on Caron Narcisse Noir. In fact, wearing Narcisse Noir Extrait next to Ma Bête, I notice that their dry downs are nearly identical, with Ma Bête showing a touch more musk. Ma Bête lasts about four hours on my skin. Notes include orange flower, jasmine, coriander, incense, musks and seawood absolute. Belle de Jour is a strange little number. It shares Ma Bête’s feeling of a silent film, but with a lighter texture and a gaseous halo of snuffed candles and cobwebs. A foot from skin, I smell its delicate floral heart, soft as down. Next to skin, I smell its animalic core. Belle de Jour’s animalic aspects are gentler than Ma Bête’s. Instead, it simply smells antique, like the back of a linen press that hasn’t been opened in decades. Belle de Jour has good, but wispy, sillage and lasts just shy of five hours on my skin. Toward the end of its wear, the fragrance loses its puffy softness, and orange flower quietly reappears. Notes include cardamom, leather, suede, Indian tuberose, birch tar, patchouli, cinnamon and tonka. Night Flower is a whole different beast than Ma Bête or Belle de Jour. This one is big and rich and moist with leather and spice. Night Flower’s leather has some of the sweet softness of Cuir de Lancôme with a strip of Knize Ten’s classic birch tar leather laid over it. Its blast of cardamom gives the fragrance a masculine vibe, but its tonka brings it into the clubroom. Night Flower is no shrinking violet — in fact, it’s barely floral to my nose at all. It has massive sillage and a half-life to match. Just a few drops should see you through the evening, no problem. 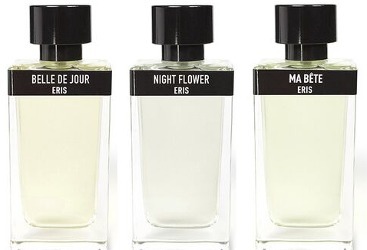 Eris Parfums Ma Bête, Belle de Jour, and Night Flower Eaux de Parfum are available at Luckyscent for $150 for 50 ml. I love that the intent of these is to bring back the good, dirty old days of fragrance. It looks like a sampler containing all three is sold out on Luckyscent right now but I will be checking back for it. I love that idea, too. Not everyone will love the animalic aspects, but people who do will really love them! I think a sampler is the way to go here. Definitely. I’ve enjoyed playing around with my samples. I snapped up that sampler on LS last week – but haven’t gotten to put any of them on skin yet. I loved Barbara’s blog (and her book was great fun, too), so I was excited to see these released. I’d love to know what you think of them! These are sitting here untested. Thought Night Flower called to me most based on the description, but now I feel a bit of trepidation (“massive sillage and half life”). Ha! Just dab it on, and you’ll be fine! Then, if you love it, you can splash to your heart’s content. I wouldn’t say they’re powerful so much as in force of waft. (In fact, Belle de Jour is kind of quiet.) But they buck trends and make a statement that way. You found a wonderful alternative! Yaaay Barbara! Night Flower is my favorite so far- seriously nice stuff. Reminds me a little of Puredistance M.
That’s great! Belle de Jour is my favorite. Ooh! I LOVE M. Can’t wait to try these. Wonderful! Night Flower sounds right up my alley – thank you for the reviews! You’re welcome! I hope you get the chance to try Night Flower soon. That’s terrific! You’re one of the patrons. You’ll definitely need to try these, then. Well. Okay, I tried all three of these yesterday, and I’d be happy to send my sampler pack on to someone else who’d like to try it (PM me if you want ’em, assuming you’re in the US). Belle de Jour is like a wearable, non-disgusting version of Secretions Magnifique. It’s a salty light floral musk that at some point does smell like skin at the beach. I wore it all day – it’s not wafty, but it lasts for hours even on me – and never scrubbed it off, but it’s just not my sort of thing. I thought I’d like Night Flower best. I love me some tuberose! However, I never managed to pick anything floral out of NF. I got a brief whiff of tobacco, and then some really nice leather, and later musk and spices. I think there might be a bit of patchouli in there, too. As time went on it got sweeter, and I thought of Musc Ravageur, Shalimar, and Organza Indecence. It’s not particularly animalic in terms of skank or body odor, or at least it doesn’t register as such the way the other two do to me. I agree on the heft of it; two drops lasted for ten hours on me, with noticeable sillage. TEN HOURS. Nothing lasts ten hours on me. I was surprised to find Ma Bete the most interesting. It smells like fur! It has that “fuzzy” aspect that fascinates me in the floral chypre Soivohle Centennial, and it is possibly the most decadently animalic of the three. I like my fur in a more perfumy setting, perhaps, because I kept thinking, “So where’s the rest of it?” It does smell very vintage, in a good way, but I wanted some chypre or some florals, or both, to go with the fur. I won’t be buying any of these, but they’re fun to sniff, and I’m glad they exist. Thank you for reporting back!I love hearing your observations on these. That’s so interesting that you see similarities between Belle de Jour and Secretions Magnifiques. I didn’t pick up on that, and I can tell I’ll have to dab them side by side like I did with La Bete and Narcisse Noir.